Star Magic will always have a special place in my heart. I started my showbiz career with them, and though I am no longer as active as I was before, they will forever be the ones who helped me realize my acting dream. This was back in 2010. At that time, I thought I was done with modeling and was pretty happy with my job as a beauty columnist and magazine editor. Then one day I got an offer to audition for Star Magic, which I thought meant that maybe I would get one or two modeling jobs a month tops. I welcomed the extra work, as that meant extra income for me. But I really had no clue what I was getting myself into. I got a casting call a few weeks after my Star Magic audition, which I found out (on the spot) was for the noontime show Wowowee. To my surprise, I got the job. And if the audition was on a Wednesday, that evening I found out I was starting that Saturday. I was scared out of my wits, but I didn’t want to turn down the amazing opportunity so I said yes. If you caught my first few weeks on the show, you’ll know how terrible I was at hosting. I think I was in a state of shock for two weeks straight. I tried my best to keep up, but it took me some time to get the hang of things. At the same time, I got a part for an afternoon teleserye, Elias Paniki (starring Jake Cuenca and Sam Pinto), which really kept me crazy busy. I did all these while taking acting classes in between. Looking back, it was all a blur as I was mostly sleep-deprived. But I was more than thankful for the opportunity. I still feel so lucky to have experienced being part of the showbiz grind, and I have to say, after all this, I have a newfound respect for our actors. They are such talented, hardworking people, as they tirelessly go from taping to appearance to doing live shows and then back to taping again. It’s a celebration of the thriving relationship between fashion and entertainment in this year’s Metro Celebrity Issue. 20 of Star Magic’s loveliest ladies don the magnificent creations of 20 of the most talented designers in the country in a special feature that pays homage to the best talent center in the Philippines. Drama superstars and local style icons Bea Alonzo and Kim Chiu, and fast rising young actresses Kathryn Bernardo and Julia Montes grace the cover, in extravagant ball gowns by Rajo Laurel, Cary Santiago, Rhett Eala, and Pepsi Herrera, respectively. Metro is available in bookstores and newsstands nationwide. Download the Metro iPad app from the App store and the Android market. Follow @MetroMagPH on Twitter and like www.facebook.com/Metro.Magazine. HOORAY! This is my first ever contest for you, my lovely readers! 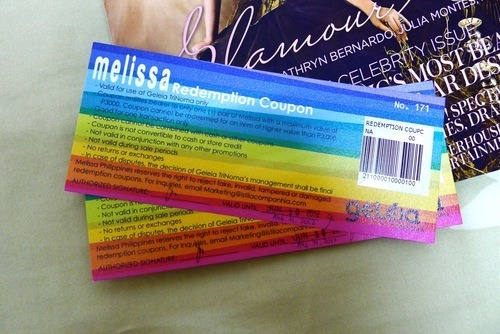 Metro Magazine has been kind enough to give me two (2) gift certificates from MELISSA shoes. All you need to do to win is to answer this question: who is your favorite Star Magic actress and why do you love her? The best answer wins a P3000 gift certificate from Melissa! There will be two winners, so GOOOOO, message me your answers!! 🙂 Ill be posting the winners in my blog and contact you if you win. You may send your answers by clicking on the ? button on the left side of the screen under the blog title (it will say: ASK ME ANYTHING when you keep the cursor there). Contest will close on August 15 (Wednesday) at 12 noon. Contest is only for readers with Philippine addresses. For those of you who do not have Tumblr accounts, please include your full name and Twitter name so I can easily contact you if you win. Good luck!